1. Make the most of foods approaching use by date: why not cook and freeze for later use? For example, cook those sausages, freeze them and then turn them into a sausage risotto on another day. 2. Remember to check the fridge daily (not just to get the milk out!) and look at dates and what needs using up – use this information in your meal planning. For example, if the eggs are approaching their ‘best before’ date then it might be omelettes for tea instead! 3. No need to throw carrots and cucumbers away if they’ve gone a bit soft. Just put them in a glass of water in the fridge – they’ll perk up in no time. You can then peel and chop carrots, onions etc, bag them and freeze. When needed, just take out as much as you need and reseal. No more soggy veg at the bottom of your veg box. 4. A curry is a good solution for just about any unused or leftover food, even vegetables that are on the soft side will be fine in a curry or casserole. 5. Always finding the half used jar of pesto at the back of the fridge? Why not freeze the leftovers for another day? 6. Understand the best way to store foods to keep them fresher for longer. Keep your fridge at the correct temperature: below 5°C. 7. Storing fruit in the fridge can extend its life for up to 2 weeks (this does not work not bananas and pineapple). 8. 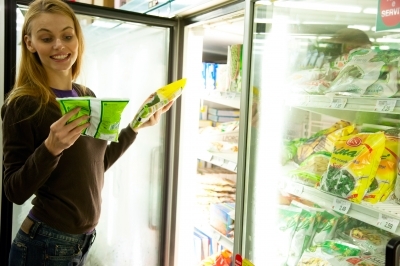 You can keep food safely in the freezer for years, in theory, as long as it has stayed frozen the whole time. However, the taste and texture of food changes if it’s frozen for too long, so you might well find that it’s not very nice to eat. 9. Plan around your schedule and choose a time to plan when you will not be interrupted (too much) – include meals from the freezer, leftover recipes (e.g. pasta for tea, leftovers for lunch), cooking double and freezing half. If possible, use the time to look through cook books and recipes. 10. Get others involved in menu planning – this ensures there’s something for everyone. Categories: Environmental Campaigns, Food waste, waste minimisation | Tags: food bills, food packaging, food research, food stoarge tips, food storage, food transportation, food waste, freezer, Freezer Geezers, freezing food, fridge storage, love food hate waste, meal planning, shopping for food, shopping habits, shopping list, shopping sensibly, top 10 tips for food storage | Permalink.